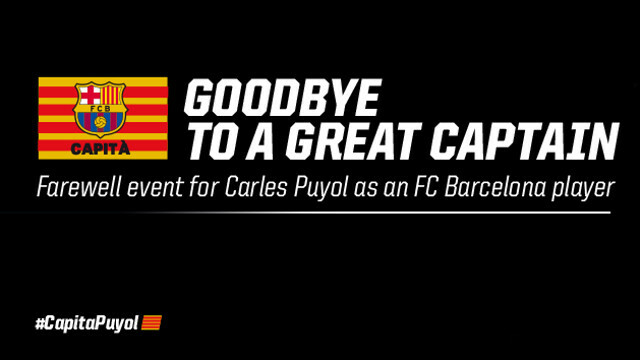 Next Thursday 15 May at 13.30 in the Auditori 1899, the Club is holding a farewell event to honour Carles Puyol’s retirement as an FC Barcelona player. The event will be attended by president Josep Maria Bartomeu, and representatives of the Board of Directors, the first team squad, coaches, friends, relatives, executives and other dignitaries. Carles Puyol started out as a footballer in his hometown of La Pobla de Segur. His huge potential soon showed through and in the 1995/96 season he joined the Barça youth system, living at La Masia. It wasn’t long before he was one of the key members of the Barça B team, and on October 2, 1999, his dream finally came true when he made his first team debut. His first major title as a Barça player was the 2004/05 Liga, when he lifted the trophy at the Camp Nou as first team captain. The following season, 2005/06, the Catalan defender led the team to another Liga title as well as his first Champions League in Paris. In total, he has won six Ligas, three UEFA Champions League, two Spanish Cups, two European Supercups, six Spanish Supercups and two Clubs World Cups. In addition, with the Spanish national side he has won one World Cup, two European Championships and a silver medal at the 2000 Olympic Games.